Remember when you had to do payroll manually? Man, we sure are glad these days are behind us now. But are they? Are they really behind us? I’m afraid not wholly. I’m afraid not quite so, as many businesses still refer to old-fashion methods such as hiring a third-party to manage their payroll for them, and this is not the best way to do it. There are so many benefits to using a payroll software; it allow businesses to automate and manage the process of paying as well as rewarding the employees. A payroll software will do all the calculations – including taxes, make deposits, print checks, and more. If you are not entirely familiar with payroll software yet, it’s probably a good idea for you to take a minute to learn the benefits of using payroll software. There are many types of payroll software available, but we are here to look at one certain type: the type that doesn’t cost a lot – or doesn’t cost anything at all – while still being capable of getting the job done just as efficiently and as accurately as any of its competitors. SEE ALSO: Why Open Source Software is good for Small Business? OnPay. OnPay is a cloud-based payroll software that provides all the payroll functionality and features for small and mid-sized businesses. OpenPro. OpenPro is a cloud-based resource planning solution designed for businesses of all sized. Thankyou Payroll. Thankyou Payroll is a ‘social business’ that can handle payroll and integrate with other accounting solutions such as Workflow and Xero. Wave Apps. Wave is very popular with entrepreneurs and small businesses thanks to its price, features, and ease of use. 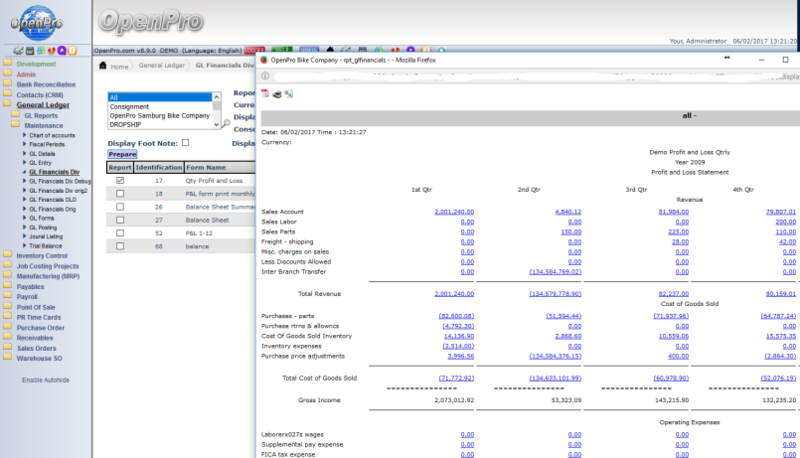 Payroll4Free. Payroll4Free is an online payroll solution that can provide small to midsize businesses with the full range of payroll functionality and features. *Please Note that the order they are presented here by is completely random, for what it’s worth. 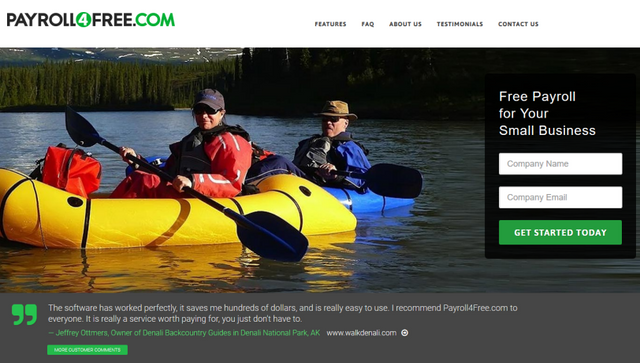 OnPay is a cloud-based payroll software that provides all the payroll functionality and features for small and mid-sized businesses. The solution helps businesses by streamlining the payroll processes and automating tax filing and payment workflows. 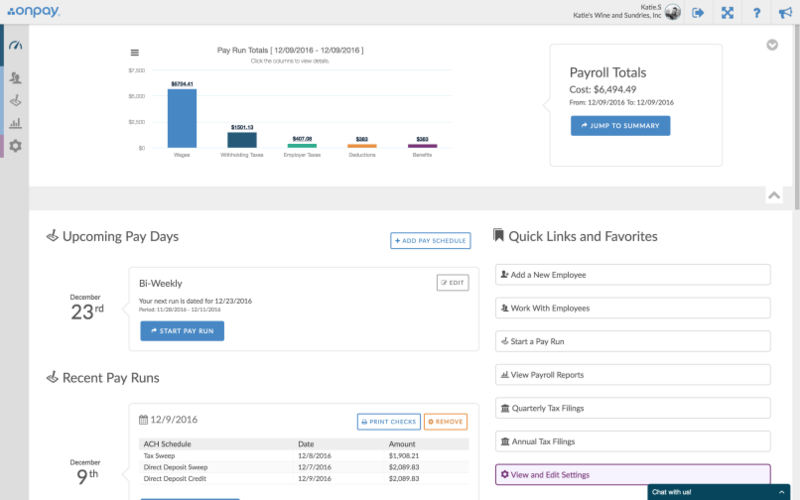 Users can easily and quickly enter payroll information (hours, tips, bonuses, etc.). OnPay can also handle benefits such as health insurance and compensation insurance. Users who can pass the risk assessment conducted by the provider can use the direct deposit feature, but all users can pay employees through check without going through any tests or inspections. OnPay can also calculate state and federal taxes, do the withholding, fill tax forms, and even make tax payments. The solution guarantees accuracy and the provider will take responsibilities if any errors ever were to happen in the tax filings. On the surface, OnPay may look basic, or more basic than some of its competitors, but this simplicity means that the solution can focus 100% on delivering its core services as efficiently as possible. This simplicity also serves to help new users get the most out of the software without being confused by an interface that’s overcrowded with features that they may never get to use. The solution is not free, but it is in the “affordable” price zone which makes it suitable for small and midsize business, and OnPay offers a one month free trial on all their plans if you think this might be the solution for you. OpenPro is a cloud-based resource planning solution designed for businesses of all sized. The suite can deliver financial accounting, order management, distribution planning, and order management. The financial accounting features include not only payroll management, but also accounts payable, check reconciliation, accounts receivable, and general ledger. OpenPro also comes with distribution management features, including order processing, purchase orders, a point of sales (POS), job costing, warehousing, inventory control, and EDI. OpenPro offers CRM module as well that allows users to handle customers and their relations with them with efficiency. OpenPro is, as the name might suggest, an open source application, and the solution can run on Windows, Mac OS, or Linux. OpenPro is easy to use and easy to personalize so it can play nicely with the already-existing systems and workflow of your business. Another strength of OpenPro is a rapid entry as users can enter information quickly and in no time, making the workflow a bit smoother and more efficient. If you were to run into any issues with the software, you can always reach the customer support which has been reported to be very helpful and efficient, and the software has a reputation of being reliable so you shouldn’t need support anyway. OpenPro is suitable for businesses in different businesses, but most of its customers are in the Manufacturing business, and the software is more suitable for midsize to large businesses. Thankyou Payroll is a ‘social business’ that can handle payroll and integrate with other accounting solutions such as Workflow and Xero for added functionality and advanced features. Thankyou Payroll allows users to manage employees’ leave entitlements, keep track of changes in legislation, which can be especially challenging for those who are not used to keeping track of changes the IRD and the Department of Labor make to the legislation regularly, to make sure you never have to go through the trouble of employee dispute claims or compliance issues. Although this is not the most feature-rich solution you can find, not even the most featured one on this list, it can still be scaled up to some extent, so you don’t need to worry about having to move to another solution as your business grows and so does its needs. Thankyou payroll can also track and calculate employee work hours automatically, or you can enter them manually. The solution is relatively easy to use, and should you run into any issues, and you will almost always find the answer thanks to the 24/7 community support available. Thankyou Payroll is safe and secure, so don’t need to worry about the data of your employees. The solution also guarantees the accuracy, so you never have to worry about making any mistakes, because as we all know, even small mistakes could cost a heavy price. Thankyou payroll specialty is in handling the payroll of charitable organizations, and they even support the broader community of New Zealand through their Thankyou Charitable Trust. They donate .25 cents per pay, per person paid, to the trust to make a positive impact on their society. Another point worth mentioning is that if your business actually deals with the Thankyou Charitable Trust and donates $30 or more every month, they will waive the fees they charge on any pay running faster than the two day plan, which makes it an excellent option for midsized businesses (or small businesses with more than 20 employees) – as it can save you quite a lot of money when compared with other options. You didn’t think I make a list with the words “best” and “free” and not include Wave, did you? Why? Because Wave Apps is one of the top free business platforms available today. Wave isn’t only a payroll solution, but more of an integrated business platform that offers Accounting, Invoicing, Payroll, and Receipt Scanning – all provided in a compact, easy to use, and completely free package. Wave is very popular with entrepreneurs and small businesses thanks to its price, features, and ease of use. Indeed, the system is easy to set up and use with a simple and easy-to-navigate dashboard that has everything you need easily accessible. 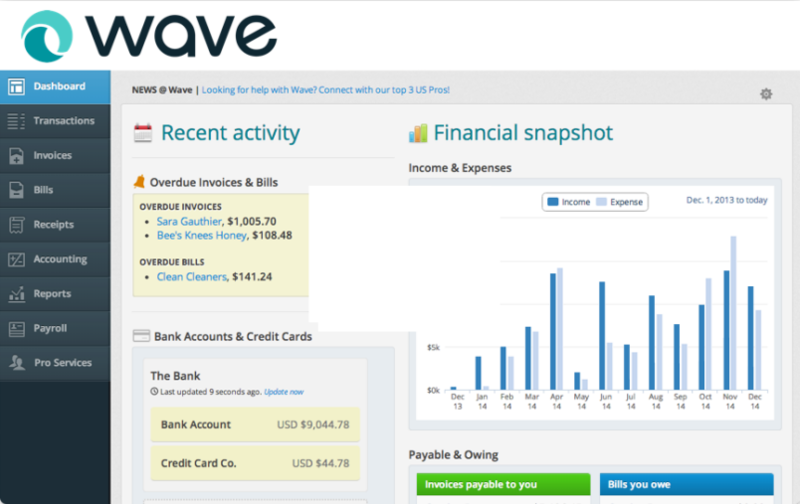 Wave helps businesses create professional invoices, estimates, and receipts. It also has the tools for receipt scanning, expense tracking, and bank connections. It can do tax and payroll calculations easily, efficiently, and accurately. Wave’s automatic billing and invoicing is a great time-saving feature, such as their recurring bills and invoices, and reminders (of paid and unpaid items). The solution allows users to pay their employees via online pay stubs or direct deposits, and they can do so from any place in the world. Wave is more of a business platform than a payroll solution, but the features it offers make it worth investing time into it, and it truly is a free solution. There are no hidden fees or undeclared charges. As you might have correctly guessed from the name already, Payroll4Free is an online payroll solution that can provide small to midsize businesses with the full range of payroll functionality and features. 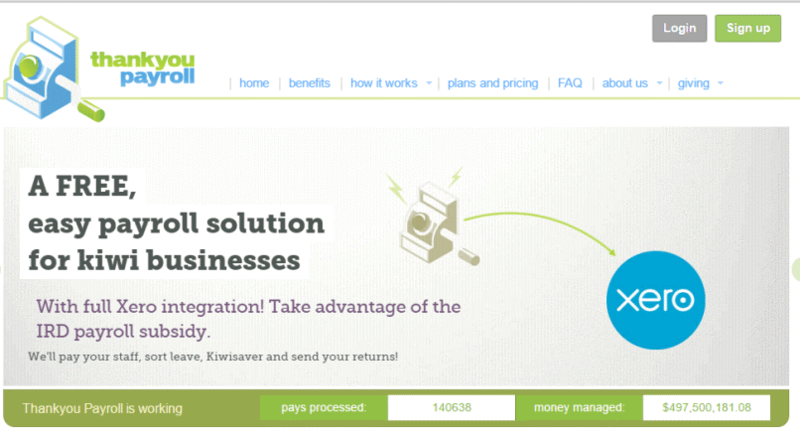 The solution offers all the basic and necessary tools to handle the payroll processes for up to 25 employees. Payroll4Free also offers a tax calculation and form filling feature that can handle federal, state, or local taxes with ease. It can also keep track of employee vacations, PTO time, and sick leaves. The solution will then calculate all these factors and accrue the exact number of each employee’s billable work hours. Chances are, you already have an IT infrastructure in place by this point; you have other software solutions to handle your other accounting processes, and if so, Payroll4Free is an excellent choice as it can be integrated with third-party applications and services easily so you can export all your payroll data to your other accounting solutions. You can also use an integration to import employee hours from an already-existing time clock file. Payroll4Free also offers an employee portal so that your team members can get an overview of their payroll information anytime they need. I hope you found what you were looking for in this article if you didn’t, why don’t you check out the Best Payroll Software for Small business in 2018. Also, if you are a Mac user, you should probably check out the Best Payroll Software for Mac as these can run better on Mac OS than their competitors. If you found this article helpful, useful, or just fun to read, why not share it with a colleague who might find it useful, too? If something’s bothering you, be it a question, comment, or even a pun that you just need to let out of your system, feel free to leave it in a comment below and we will do out best to get back to you (or at you if it’s a pun) as soon as possible.